What Occasions Are Best To Serve This Lemon Cream Cheese Pound Cake? If you were to ask me, I will say all year long and on all occasions. Will the amazing texture and flavor this lemon pound cake will be the hit of any party or get together. The best part is being able to add different types of fruit as garnish, as the lemon flavor and cream cheese glaze will go wonderful and delectably with any fruit. Preheat the oven to 325 degrees and grease a 9-inch loaf pan. In a large bowl, beat the butter, cream cheese, sugar, and vanilla on medium speed until creamy. Add cake flour and baking powder. Beat at lowest speed just until combined. Add lemon juice and lemon zest. Stir in using a spoon. Pour batter into the pan. Place aluminum foil over the top. Bake for 45 minutes then remove aluminum foil. Bake an additional 45 minutes, checking often. Pound cakes are fickle, so keep a close eye! The cake is done when a toothpick or knife inserted in the center comes out clean. When the cake is done, remove from oven and cool completely. Meanwhile, prepare the glaze by mixing powdered sugar, cream cheese, lemon juice, and zest and vanilla in a bowl on low speed using an electric mixer. Adjust the consistency to your liking by adding more powdered sugar to thicken, or more lemon juice to thin it out. When cake is cooled, pour glaze over top and set aside to “set”. Garnish with additional lemon zest and fresh berries. *It is important to use cake flour when making a pound cake. It has less protein content than regular flour which leads to a light cake with a fine crumb and a less chewy texture. *Do as minimal mixing as possible when preparing the batter. This might be my favorite recipe to have shared to date on the blog and to answer your question, YES, it tastes just as amazing as it looks in the photos! 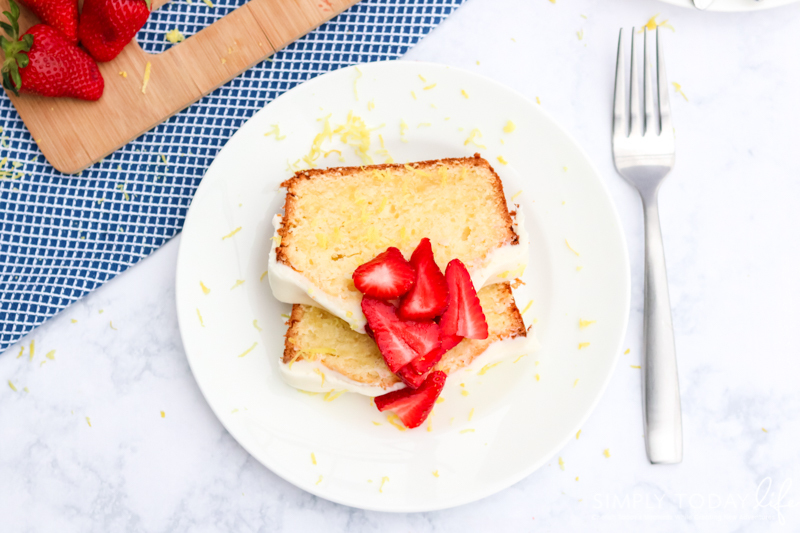 This Cream Cheese Lemon Pound Cake recipe would make the perfect Easter brunch addition or simply a delicious breakfast for Mother’s Day! 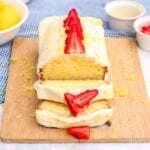 Will you be making this easy Lemon Cream Cheese Pound Cake recipe?